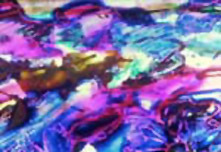 One of dozens of hand-painted films that Brakhage completed in the last two decades of his life, The Dante Quartet can be regarded in some respects as a cinematic approximation of abstract expressionism, illuminated and brought into motion as if shot through an endlessly shifting, almost liquid, stained-glass window. This comparison is in keeping with Brakhage’s own view of his work: he more often discussed the relation of his filmic practice to the great painters than to those he considered the great filmmakers, and he definitely saw an affinity between his own work and that of Jackson Pollock. The two artists shared concerns with large-scale graphic patterns and abstractions, the need to move their art out into nature, and the relation of artistic practice to internal subjective graphic patterns and experiential states; both pursued visions far beyond the representational norms of their respective media. Yet the scale of the two artists’ work seems much different. The common image of Pollock dripping paint over canvasses in large, masculine strokes is far-removed in sensibility from the intimate, pared-down, and less obviously grandiose practice of Brakhage (notwithstanding the latter’s volume – approximately 380 films – and obsessiveness). Though he did initially work on a smaller, more intimate scale, Pollock’s large canvases attest to the size and significance of his artistic vision, in contrast to the minute frames of Brakhage’s endlessly shifting and accumulating cinematic universe. Despite their obsessive layering and the liquidity of their seemingly dripping brushstrokes, Pollock’s canvasses are fixed images, resembling snapshots of a vision in the mind’s eye (without of course literally being so). Brakhage’s films are less singular, more the expression of an endless striving experience or process. Pollock’s large works show us a vision, challenge us to perceive patterns and threads of meaning, while Brakhage’s smaller-scale but encompassing films are vision, their visual fields less an attempt to represent a subjectivity than a more inclusive, even universal subjective visual experience or encounter. Although the world created by both artists is tactile, Brakhage’s seems more intimate, less that of a craftsman than a gifted amateur, less rural or urban than domestic. While Pollock could see his creations boldly take shape in front of him, Brakhage needed to project his accreted vision onto the screen in order to see into (and beyond) the small-scale, predominantly single-frame universe that he obsessively tinkered over. Painstakingly crafted over six years (an unusually long period for the prolific Brakhage), The Dante Quartet is a palimpsest composed of fragments of footage originally shot on 35mm, 70mm and IMAX stock that have been layered with drips and washes of colour, scratches and graphic patterns. (The film itself has been distributed on both 16mm and 35mm, though never in the large IMAX format that Brakhage initially envisaged as ideal for a work of cathedral-like dimensions.) The finished film retains some of the material marks of these “origins”: the size and dimensions of the image change at several points, and remnants of the original “found” footage (including images from a worn 70mm print of Billy Wilder’s Irma la Douce ) rise to the “surface” of the image. (Curiously, the “painted” quality of the film creates a sense of depth or layering that has little to do with ideas of Renaissance perspective: a “thickness” uncommon to Brakhage’s films in this mode.) Although the film is largely abstract, these more recognisable (readable?) representational fragments help to both anchor and confuse our understanding of its “subject”. When I have screened this film for students, they often attempt to hang onto these brief snatches of “photographic” information, along with the fragments of scratched text that divide the film into less than fully distinct chapters. However, they rarely find anything very useful to do with these glimpsed images or texts (often questioning whether they indeed saw them), their mimetic or narrative properties of little use in navigating through the film. The Dante Quartet is in fact the end result of Brakhage’s almost lifelong fascination with The Divine Comedy. It is a brief but spectacular filmic attempt to find a visual equivalent or rhyme for the four stages of the ascent from hell depicted by Dante: divided into “Hell Itself,” “Hell Spit Flexion,” “Purgation,” and “Existence is Song.” For Brakhage, this visualisation is achieved by “bringing down to earth Dante’s vision, inspired by what’s on either side of one’s nose and right before the eyes: a movie that reflects the nervous system’s basic sense of being.” (1) Thus, his vision of Dante is experiential, grounded in the transformative realities of earthly existence; for Brakhage “heaven” or “god” is to be found in the physical reality or materiality of the world. In many respects the details of a progression or transformation are difficult to fathom from the finished seven-minute film – all of which has a luminous visual beauty. In the third and fourth parts, the range of colours and the luminous quality of light come to the fore, with a shift from the smudged tones of the first part to a more visionary, cosmic set of images (as often in Brakhage’s work, there is a simultaneous movement inwards to a subjective vision and outwards into the universe). The increasing representational content of these final sections – including the lava of a volcano and the horizon of the planet – signifies a return to the earth, to non sequitur images or cleansing visions that cannot be contained within any single representational chain or system. Similarly, the snatches of text that appear four times suggest the world of Dante’s writing (even if the final quotation, “existence is song,” is from Rilke) without ever really anchoring the film’s “representational” realm. The text dances into the film, introducing each “section”, but it always seems incomplete, quickly expunged by the patterns and swabs of painted colour (is it colour or symbol, paint or film?). Ultimately, The Dante Quartet evokes interior states and relates to Brakhage’s long-term pursuit of a cinematic equivalent of hypnagogic or closed-eye vision. The film is an approximation of vision (though it is also a vision in and of hell), an attempt to render the material world through the subconscious as traced on the skin of the eye. Of course, in this respect it is a gorgeous “failure”, settling instead for a range, depth and density of imagery seldom experienced in or created by the cinema. As a vision of Dante’s dialectical world The Dante Quartet offers an obscure, off-centre and idiosyncratic perspective that is difficult to conceive – at least initially – as anything other than a glorious celebration of the experiential and material possibilities of film stock and projected light. It is a film that is ultimately impossible to describe or adequately remember, a half-forgotten, only partially perceived place to return to endlessly, a memory-splash of colours. Stan Brakhage quoted in Suranjan Ganguly, “Stan Brakhage – The 60th Birthday Interview”, Film Culture no. 78, summer 1994, p. 26.